COLLEGE PARK, Md. - The silver foil robot rises swiftly above the field, flapping its wings and whirring like the Snitch in a game of Quidditch. Meanwhile, its human controllers below watch the trees for signs of a lurking hawk, worried the bird might mistake the robot for prey and attack. The robot, designed for aerial surveillance, is one of the many research projects underway at the University of Maryland’s new Maryland Robotics Center, which brings together 25 faculty members in 18 labs for interdisciplinary robotics research. The center’s opening this year puts the University of Maryland in the company of universities that include Carnegie Mellon in Pittsburgh and Johns Hopkins in Baltimore, which already have well-established robotics programs. 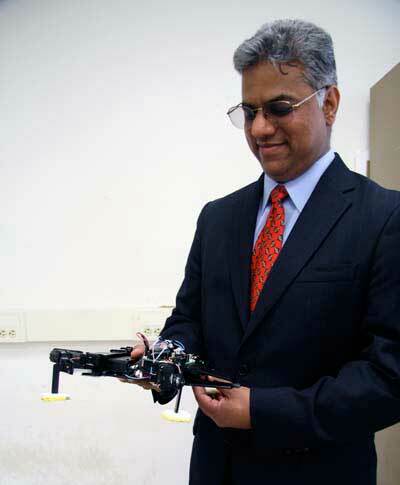 The goal at the University of Maryland is to eventually use large teams of researchers to address the “grand challenges” in the robotics field, said center Director Satyandra K. Gupta. Recognition has already come to the center for one team’s work. 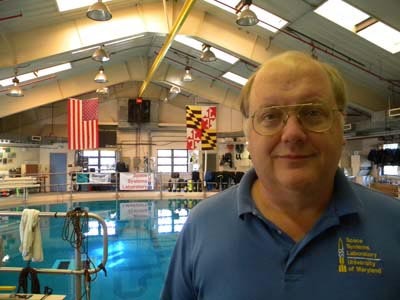 In the Neutral Buoyancy Research Facility, Dr. David Akin tests robots for how well they function in an extreme environment—outer space. They simulate the zero gravity conditions of outer space in a 25-foot deep water tank. Akin said this tank is the only one of its kind on a college campus. Robotics faculty also collaborate with industry researchers. Maxim Schwartz, a software engineer at Energetics Technology Center, is working closely with Gupta on developing an unmanned boat with funding from the Office of Naval Research. Schwartz and Petr Svec, a postdoctoral research associate at the University of Maryland, showed visitors to an open house last month a simulation that demonstrates how an unmanned boat can intercept an attacker and block its movement. The simulation software lets the robot learn how to react in different situations, such as predicting the maneuvers a pirate speedboat might take to reach a protected target. Projects like these rely on outside grants to individual researchers by the military and federal agencies, including NASA and the National Institutes of Health. Although outside grants are the main source of funding, the center also receives institutional support from the university. The engineering dean pledged $300,000 for the next two years, and the ISR provides personnel support and money for public and industry relations. Faculty members have joint appointments with the systems research institute and with their own departments. Although many of these research efforts existed before the center’s creation, it is now easier for faculty to collaborate on projects that span multiple disciplines, Gupta said. Interdisciplinary work is being encouraged elsewhere at the university. The merger this week of the College of Chemical and Life Sciences and the College of Computer, Mathematical and Physical Sciences will make collaboration easier, said Dr. Steve Halperin, the new college’s dean. Although research is a focus at the robotics center, an open house last month – Maryland Robotics Day – made it clear how important the educational aspects of the center are. Center officials had expected industry representatives, defense contractors, government lab workers and academics to attend, said ISR spokeswoman Rebecca Copeland. Four hundred people registered for the open house. But 100 high school students and their science teachers also showed up, surprising organizers. Ghodssi said it underscores how important the center may become in attracting high school students to the university. Copyright © 2001, 2002, 2003, 2004, 2005, 2006, 2007, 2008, 2009 and 2010 University of Maryland Philip Merrill College of Journalism. All rights reserved.